Have you found an online vendor selling Wood's 100 Old Navy? This has all the connections and nostalgia that rum should have. When you drink this you could imagine you are out at see, or half way around the world. You could imaging drinking it in a warm home with friends or when it’s freezing on a rooftop bar in a European city. It’s dark, but not overly sweet, it packs a real punch but does not destroy your taste buds. For me this is the definition of rum. Semi-sweet chocolate chip nose. Some high notes but no ethanol. Smooth yet slightly prickly palate. Has an old/musty element. Very nice. 7, 7+ for rarity? Rubbery and earthy on the first sniff. Follow by dark chocolate, toffee, flambe banana, jackfruit and sweet spices such as anise and clove. Very complex on palate. woody, earthy with a touch of burned/ charred aroma flavor. It tends to be slightly sour and salty (dried sour plum with sugar dust) and follow with sweet bitterness towards to end. It's then covered with flavor of clove and honey syrup. Unripe banana which itch the gum on the finishing and sweet spices lingering . As near to a Pussers Tot as I have had as a commercial brew and I have plenty of the former before it was stopped in the Royal Navy. A crime to mix it, should be consumed neat to really enjoy if you don't you don't enjoy or know rum. Wood's is a true classic and it's easy to see why sailors were upset when the tot was stopped if this was what they were drinking. This rum is exceptional value for money and a classic, using a recipe from 1887 and distilled in the world's oldest and only wooden still. I always have a bottle of this on the shelf and it's always gone far too quickly, this is easily my favourite rum in terms of cost effectiveness. Nose and taste are predominantly toffee, caramel, Christmas pudding and similar flavours - all very pungent and long lasting due to the higher ABV of 57% (which is always great with rum). 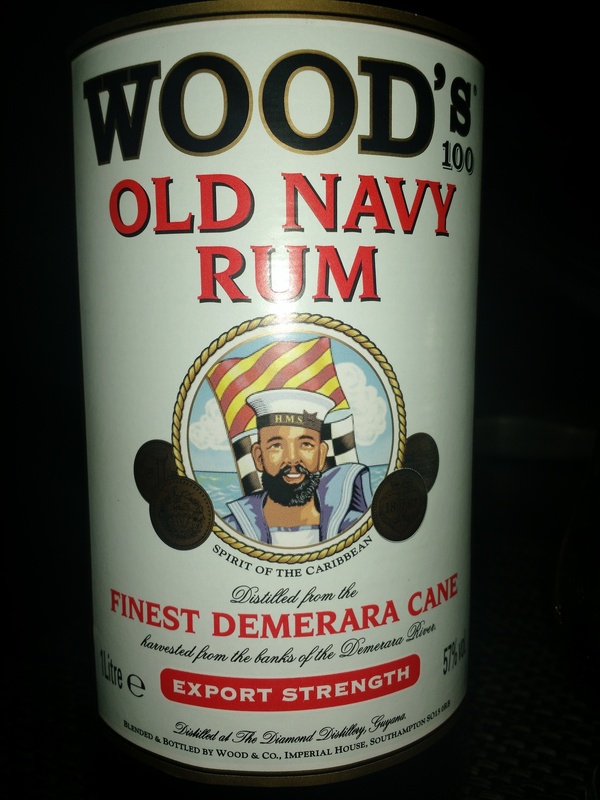 If you haven't tried this yet you should seek it out immediately - a fine example of navy rum and Guyanese rum, using Demerara. Nose: Toffee, cinnamon, cloves and pepper spice on the nose with thick caramel notes. Palate: Muscovado sugar, soft toffee and just a hint of the spice detected on the nose. This is very smooth, belying its hefty abv. Finish: Surprisingly short but thick and syrupy toffee notes abound. Overall: A rich, dark rum with a high abv that retains its smoothness. 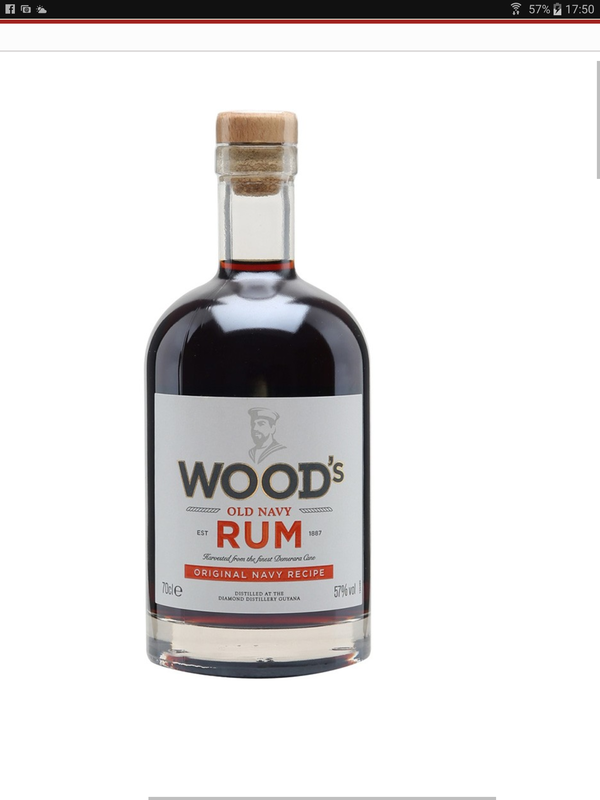 Would work well in a dark and stormy, despite the fact Wood's is distilled in Guyana, and not Bermuda. I’m not a navy rum fan usually, but i do like this one. Bags of flavour. Surprised our Navy is so respected if they got on this before battle. Bugger me, it's lethal. But very tasty. Tried it neat and I admit I'm not man enough to do that again. Slapped some ice and pepsi in it. Being ex Royal Navy, this is an obvious favourite of mine. One of the first rums I ever tasted, and one I always go back to. Lots of layers of flavours, and one to savour. The rum itself is very dark, almost black in the bottle, perhaps the result of aging in heavily charred barrels, but more likely a result of a liberal dose of the caramel coloring. The nose is heavy and sweet, chocolate, a bit of cinnamon, pudding. The palate is sweet and oaky, with smoky, slightly astringent, complex notes that gradually develop into a lasting, powerful, slightly spicy finish. Notes of cocoa, tobacco, muscavado sugar, leather, and banana. The mouthfeel is full and rounded. This rum can be enjoyed on the rocks or with a splash of water, but excels as a mixer in Dark and Stormy, or even rum-based Old Fashioned. First to hit you is the strength at 57% this is serious rum. After the initial strength, you get wood and earthy flavour with demerara sugar, banana, toffee, dark chocolate coming through. Complex flavours and you can drink this as a sipping drink, however I tend to favour the Cuba Libre with Pepsi Max blends into an amazing strong sipping long drink. Not too sweet and not spiced although hints of spices are to be found. My mixing and everyday Rum of choice, partly down to the flavour and the affordable price range. Picked up on offer in the UK. Off the bat there are deep toffee and caramel scents and upon further tasting the woody, smokey flavour develops. Ends with a quite surprising Christmas pudding flavour which is absolutely delightful. Very enjoyable, and made me smile a great deal. A great choice and was impressed by the presentation and complex flavour. Read a little about part of the rum being stilled in a 250 year old still, interesting. I would like to imagine that is what the british navy used to drink a few centuries ago... and it’s good!! Tried it neat and even at 57% this one was smooth (maybe a bit of sugar added?) with some prominent notes of caramel (amongst other). This navy rum won a place in my cabinet. Typische Demerara rum uit Guyana. Molasses, eiken, tofee en rozijnen. Gebotteld op 57%abv maar zeer geschikt om te sippen. Goed voorbeeld van een navy rum. I couldn't resist getting a bottle when I saw it on offer in sainsburys £16!!! Great taste, no way would I spoil this with coke or ice or anything else. Sorry but I did not like it at all, I like rum but this one would put me off rum completely way too strong left horrible under taste in my mouth. A staple diet for every British sailor was pussers and woods. This is currently my favourite rum and has been cherished by me since my first sip back in the days when I was on the High Seas during the 60's and 70's. It is a powerful, very dark, almost black colour with an intense demerara sugar nose and super smooth burnt sugar taste that lasts and lasts and warms the cockles of your heart! "spice in a very upfront punch in the face kinda way"